Mako’s recent post about a laptop sticker reminded me of an experience I had riding the London Underground earlier this year. 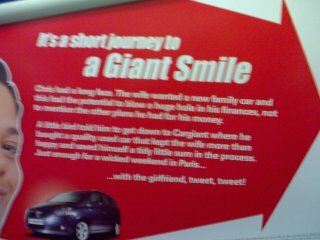 On my way home from work one day, as I was thinking about other things, I happened to read the text on one of the many advertisements posted inside the train car. While gender offences in advertising are regrettably common, this one was so overt that it caught my attention and made me feel embarrassed at reading it. Chris had a long face. The wife wanted a new family car and this had the potential to blow a huge hole in his finances, not to mention the other plans he had for his money. …with the girlfriend, tweet, tweet! “Chris” beams at us with a joy that could only come from the combined pleasures of pacifying his wife, protecting “his” money from her, and spending the savings on casual infidelity. Was it simply ignorant, or a failed attempt at humour? Either way, the message was not one I was glad to receive. At the time, all I thought to do was complain to the company, who offer a feedback form on their website. If only I’d had a pocketful of clever stickers, like the ones offered by Sticker Giant (whose name is curiously similar to that of the advertiser) or the more unassuming Sticker Sisters. After all, it would be much more effective to send a message to other readers of the advert as well as its creators. I felt embarrassed when I saw it because it made me wonder whether the people around me considered this to be normal and acceptable content. Seeing an angry sticker on it would have let me know that I was not alone in my objection. Stickers are good for more than just graffiti. Considering how the laws in the west have becoming increasingly misandrinistic, this ad is not off base at all. If he earned the money, it IS his money. Alimony and child support payments are becoming increasingly ridiculous in their amounts. Nonetheless, the cutesy attempt to endorse infidelity was unneeded. What a curious comment. Which laws do you mean specifically, and in what way do they promote hatred or contempt of men? Do you mean to say that you think the advert was intended as some sort of political commentary? If so, it would be a poor example, as it didn’t inform about any of these supposed issues. Even if we assume that “Chris” earns the sole income in the household, this doesn’t mean that the money, or financial decisions, are exclusively his. If he works, and his wife provides primary care for the children, that doesn’t make them solely “her” children either. Marriage is a partnership, not a collection of “mine” and “theirs”. Alimony and child support are concepts in divorce, and are irrelevant to this situation, except insofar as this hypothetical couple might be better off with such an arrangement. …or are you just a troll? I wonder if Mr. Frantz could please indulge the readers who might not be familiar with the apparent epidemic of misandrist jurisprudence in the West. After a cursory web search with the words”midandrist laws in the west”, I was unable to come up with any citations of actual laws. Further, I am also curious as to what constitutes an “increasingly ridiculous” amount of child support, given the arguably complex nature of class, gender, family, and state law. Stickers don’t help in that situation, but I should invest for the future.